This whole process is kind of absurd. But there are people whose literal job it is to pitch the region for this kind of stuff. Should they have just sat this one out because it's improbable and/or the competition was too stiff? What would the reaction have been if leaders here came out publicly and said something along the lines of, "Yeah, we're not bidding because we have no chance." They would have gotten criticized for that, too. At least no one here sent Amazon a cactus. Of course, it is a very long shot. And if a ton of effort went into this pitch, let's hope the ideas and plans and connections developed can be used in other ways. Also: This process should have prompted an honest assessment of why this area is a long shot for projects like this, and whether/should anything be done to address those shortcomings. Maybe one good thing to come out of this is a very public acknowledgement that there could be ways to better link Albany and Rensselaer. The two cities are so close geographically, but sometimes it feels like they're miles apart because of the way the current connections between them work (or don't work). I dunno, I'd hate to have anything successful that could solve our problems. The biggest reason why the would never sit here (or anywhere in upstate NY or Canada): winter. It's one thing to not be able to get products in to somewhere, quite another not being able to get out. This distribution center will probably end up in Virginia or North Carolina. Do we know if the unused portion GE site in Schenectady was considered? Lots of vacant land, the grid, plumbing, and accessibility is all there. Seems like it would be the perfect site. Weâ€™ll need a commuter rail system if this is going to work. Down with the naysayers! It's sad that you have to put in a "never gonna happen" disclaimer. No one should be laughing. I'm proud to know our hat is in the ring. Thanks Center for Economic Growth! We need some economic growth around here. As for the last commenter, I'd love to see my property value skyrocket. And I welcome millennials too- we need to give graduates of our local colleges a reason to stay and work here. Besides, our city needs some new life to blow out the cobwebs! There are too many stodgy old farts around here! I applaud CEG for submitting a bid on a regional basis! What is absent from the Amazon criteria is an international airport---Smallbany thinking is to blame.Somehow the two other regional airports ( tiny Newburgh(140,000 passengers per year) and Hartford have true international flights (Norwegian Air, Air Canada, Allegiant, Aer Lingus, Spirit). Albany at 1.388Million passengers per year has none. Jet Blue only flies to its tourist destinations in Florida. To fly between two Jet Blue cities like Seattle and Albany, you have to fly SEA to Boston, have a long layover and switch to a very small Cape Air flight. you cannot book the 6 1./2hr flight to SEA on a Jet Blue flight from ALB. (Well you can if you can dedicate 15 hrs of travel time, use Cape Air with layovers in boston and JFK.!) Southwest has 4 flights a day to SEA. Seems that we are on the cusp of truly developing....hope we all continue to work toward a more vibrant region. The rendering includes land east of the Times Union Center which would include 48 Hudson Avenue, one of the oldest buildings in the city. Not to mention the fact that traffic patterns in that area are already horrible. New jobs are always welcome, but not at any expense. I don't think anybody is proposing that this project necessitates demolishing 48 Hudson. It's just concept art. More giant river blocking concrete, poorly designed monstrosities? Perhaps they'll add a megaplex cinema to this cockamany idea. Wow what a pipe dream that a private company unrelated to government or health care could end up in this area. I think our biggest selling point is our central location, beautiful architecture in Albany, Troy, Saratoga and Schenectady, local colleges , wonderful train station and airport, good road system, plentiful work force, as well as our general relaxed way of life. Seems like a no brainer for Amazon. Dare to be great...it might happen to you! Couldn't even imagine what the south end or Clinton Ave or the warehouse district could become! This proposal will do more harm to local Albany and Rensselaer residents than it will good. Developing a huge corporation on what is currently public lands and the Albany City Bus Station will not stimulate downtown. It will make it harder for folks to see the natural beauty of the Hudson River, and construction is a messy process. Why would we want more of that? Is it the jobs? The jobs argument is hollow. Amazon's wages and working conditions have a bad reputation. The money coming into the business wouldn't go to the Albany area, it would go to already very wealthy people. Amazon is constantly in labor disputes, and bringing them here doesn't show support to the local workforce. Where will the bus station go? Where will people walk along the riverside? This proposal is not good for the vast majority of Albany residents. It is a good resume builder for the administration, but at the expense of the residents at large. It'll be great for those reaping the profits and career points, but it will be bad for the middle and working class, bad for the environment, and bad for the city overall. It's a proposal to export money, cheapen local labor, give a corporation public waterfront property, and inevitably dodge taxes. Where will the bus station go??? How will people walk along the river??? (I'm down there most days and am usually the only PERSON.) who needs jobs??? The pay is low???? The CITY will be crowded??? Beam me up Scotty! Where do I live when people think like this??? I can only hope these posts are meant to be sarcastic.....but I really can't tell! We will all know this won't happen but if a miracle happens and Amazon chooses capital region as its second headquarters, that would be biggest thing that has ever happened in this region. Seems an extreme way to get Amazon to pay for the Gondola. If they didn't try to submit a proposal, CEG would be raked over the coals for not doing their job. Ask for what you want or take what you are given. Pretty clear that they needed to do this proposal to fulfill their basic mission. I think it's fine. It's preliminary concepts demonstrating how the space is available to meet the company's needs. I really applaud the creativity thought behind trying to attract Amazon. Having a behemoth like them here, being led by someone like Bezos, could really lead to a fantastic waterfall effect on the region at-large - attracting restaurants / businesses / amenities, building up infrastructure, etc. As always, the naysayers are concerned with adding a minute to their commutes from the office back to the suburban castle away from the riffraff. Considering that Amazon would employee nearly 5X the number of people that currently work at the Empire State Plaza, I think it's safe to say that we'd have a drastic re-imagining of roads and transportation in the area. Maybe you'll get that exclusive personal lane added to the highway after all. So glad that CEG recognized the need for the bike and pedestrian connection. I know, just a rendering, but that bridge won't fly with Army Corps or coast guard because it would choke the river traffic below its low draft. My broken record pitch for the Livingston Avenue Bridge walkway remains. My comment is speculative - assuming it's any lower than the dunn memorial - which needs a terrifying array of ramps to get to the deck - ramps that render access by bike or the disabled an impossibility. 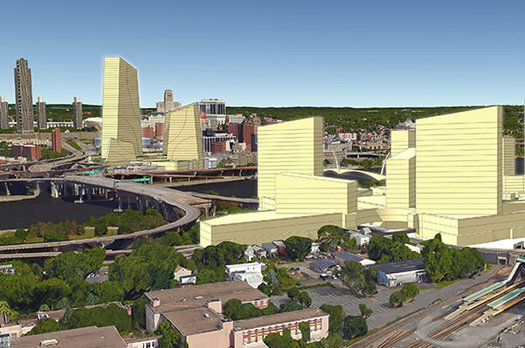 In the insanely unlikely event that Jeff Bezos decides to bestow this gift of prosperity and modernization to the Capital Region, I personally promise that 48 Hudson will be disassembled piece by piece by a team of archaeologists and reassembled and restored on the roof of the Albany Institute of History and Art. The Central Warehouse will be turned into a parking garage (killed two birds with that one) and covered with non-offensive murals. After the rest of Amazon employee parking is planned out, we'll put in an *extra* 5,000-space subterranean parking garage only usable by Albany residents. It will be covered in a green roof / public park with an unobstructed view of the Hudson. I-787 will be completely removed and replaced with a Hyperloop. Albany *International* Airport will finally live up to it's name. The State will put billions into high speed rail to the city. Property values all over the Capital Region will soar, making all existing residents wealthy. The few, most curmudgeony residents opposed to any type of progress or improvement to the city they claim to love will be relocated to a nice farm on a hillside filled with nice soft rabbits to pet. No. Too much of the waterfront in Rensselaer is just given away. 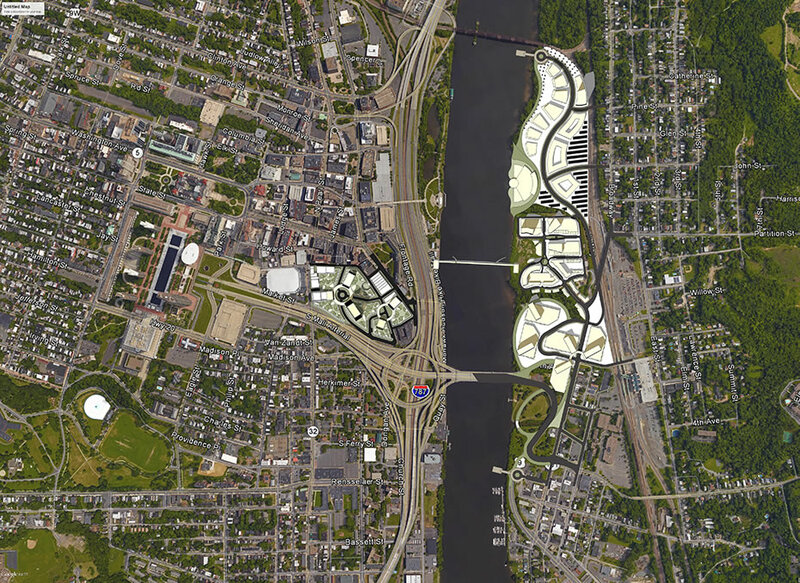 I say if amazon wants into albany (which, get real, they don't) they can pay to bury 787, use that land, and keep the access to and use of the albany waterfront public.